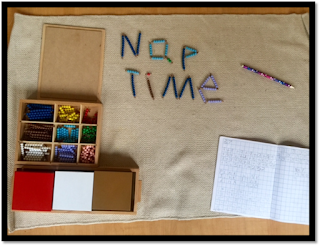 Minds in Bloom is excited to welcome our new guest blogger, Megan, and a new topic – Montessori and the Common Core! 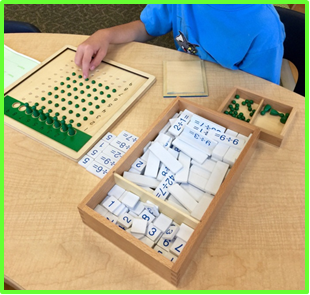 Please read on to learn Megan’s insights about how Montessori and the Common Core State Standards can be effectively intertwined. I was mid-way through my student teaching semester at a traditional public school when my supervisor approached me after a lesson and told me that I was “meant to be a Montessori teacher.” Um, what? I had learned about Dr. Maria Montessori in a philosophy of education course, but at this point in my life, I had never even been inside of a Montessori school. After I shared this revelation with a professor, he lent me a copy of Montessori’s The Absorbent Mind. I read it cover to cover, and here we are: I am approaching my fourth year as a Montessori teacher, and I would have it no other way. Although the research-based philosophy is over a century old, many misconceptions about the Montessori approach persist to this day, and perhaps just as many misconceptions persist about Common Core Standards. 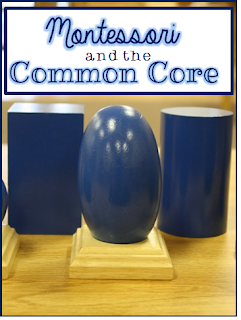 For some, hearing the terms “Montessori” and “Common Core” in the same sentence might sound like an oxymoron. However, as public and charter Montessori schools continue to grow across the United States, more and more educators are called to align state and national standards with the Montessori philosophy of education without diluting its benefits. Our goal is for students to access the same academic content that they would be taught in any traditional public school while adhering to the holistic Montessori philosophy. Following students as individual learners and allowing them to progress at their own pace in a carefully prepared classroom environment, fostering their developing independence and executive functioning, igniting their curiosity in the natural world, and promoting practical life skills happens in any strong classroom and encompasses the premise of the Common Core. 1. Let students teach and learn from each other all the time. 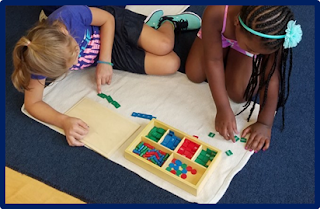 Montessori classrooms include multi-age groupings (traditionally first through third grades and fourth through sixth grades at the elementary level), which offers ample opportunities for students to learn from their peers. Although paramount to Montessori, cooperative learning can be promoted in any classroom, because no two learners are the same. Being able to teach a concept indicates the high level of learning that Common Core Standards strive to ensure, and students across all levels should be able to engage in productive, role-specific collaboration whenever possible in working toward this goal. A favorite subject in my classroom is often grammar (I kid you not). From the early childhood level, students learn to identify parts of speech using Montessori grammar symbols. The task of analyzing sentences or paragraphs becomes a fun, increasingly complex system of puzzles. 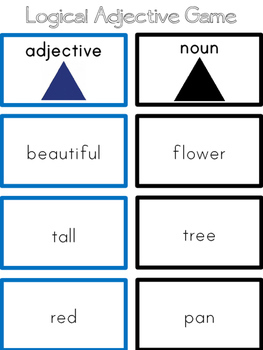 For example, the Logical Adjective Game above incorporates reading, writing, and parts of speech through Montessori grammar symbols while aligning with Common Core ELA standards for first grade and up. Students match logical pairs of nouns and adjectives and transform those into phrases and sentences to record and analyze. With independent classwork like this, students are able to progress through concepts at their own pace. They do not need to wait for the rest of their classmates if they are ready to move on, and students who need more time are able to have it. 3. Allow students to take ownership of their classroom. 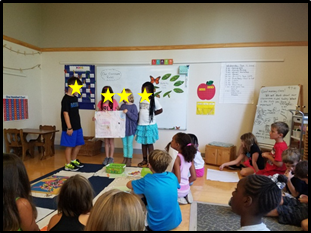 Each year, students work together individually, in small groups, and as a class to design our class rules. We emphasize taking care of each other, as well as the classroom environment. With shelves full of materials and flexible seating, students learn to independently manage their personal and collective work space. At times, there may be 20 different activities going on at once in the classroom, so students also need to manage their personal work plans, as well as the volume of their voices. If the classroom becomes too noisy, there is a chime that students are allowed to ring and request that it be lowered. This way, the teacher is not always giving the reminders, and students become better able to self-monitor their learning and behavior. We encourage practical life skills through classroom jobs and regularly incorporating related activities, such as cooking and gardening into our day. 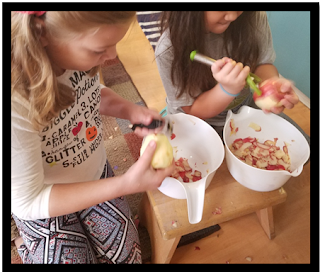 Students peel apples when making applesauce in the fall. Then they recorded the steps to make recipe cards for their families. 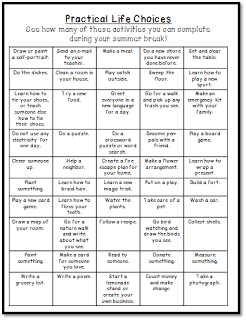 Over summer break, my school’s grade level offers a Practical Life challenge in a bingo game format to encourage students to further develop these important life skills at home. 4. Provide students with hands-on opportunities to follow their interests and learn at their own pace. Provide students with academic choices and let them “show what they know” in a variety of outlets. Integrate content areas and incorporate the arts to reach more students’ interests. I had a student once who loved division. Yes, division. She came into my classroom as a second grader barely able to add or subtract, but she was attracted by the Montessori Test Tube Division materials that she saw a third grader using, and she begged for a lesson. 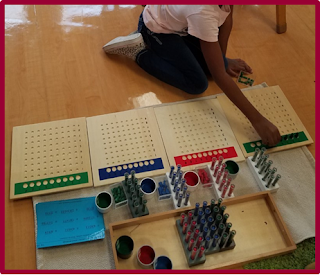 I taught her the simplest form of single-digit division using the Montessori Division Bead Board, a material that allows students to see division as repeated subtraction by physically dividing beads into equal groups. Once she mastered that, I promised her that she could move on to the the larger, more complex Test Tube Division work. She continued to use the Division Bead Board material during her “choice” time, and by the end of the year, she was able to concretely solve multi-digit division problems with regrouping. As she entered third grade, she could look at a long division problem and know whether or not it would have a remainder. Not only did the hands-on material attract her to math, an area she often struggled with, but the qualities that made the material hands-on and fun are also what helped her develop the intrinsic motivation necessary to independently persevere through a challenge and take her learning to a higher level. A student gets creative with the Snake Game material for adding number strings! 5. Teach students to recognize mistakes as a natural part of the learning process. Standardized tests can cause teachers in any setting to feel the pressure of ensuring that each child masters specific skills and concepts along our government’s prescribed trajectory. 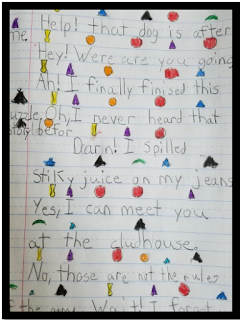 You may have noticed some inventive spelling in the picture of my student’s grammar analysis! With the Montessori approach in mind, it is important to minimize corrections and to allow students the chance to make and learn from their own mistakes. As teachers, we need to determine the right amount of support and scaffolding for each student based on their unique needs. We should celebrate the process of learning and our students’ achievements in equal measure. 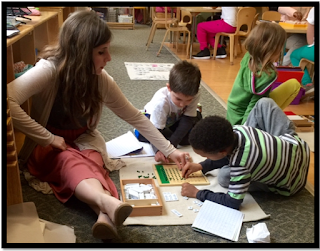 Megan Feliceangeli teaches second and third grade at a Montessori charter school in Wilmington, Delaware. Outside of the classroom, she enjoys creating and sharing her Montessori-based, Common Core-aligned ideas at her blog and Teachers Pay Teachers store! Loved the guest blog! Well written and very informative.